What do you make when you have just enough material left over from your last project to make something else? Why leggings, of course! When I originally saw the black diamond row fabric, I knew that I wanted to make a fun pair to wear this fall\winter (in fact, I’m wearing them today with a black tunic tee and booties), but I also new that it needed to become the Fraser once that pattern was released… so I was thrilled that I had enough left over to make a pair! For this version, I used my favorite pattern Jalie 2920 (just as an FYI I always go up one size when I make this just because my thighs are ‘thicker’ than what the pattern is graded for). The stretch in this particular print is at the bare minimum required so if in doubt when using this print (or similar from Girl Charlee) go up one size – they are definitely more comfortable. The best part about making your own leggings? The stripes always match! This entry was posted in Uncategorized on September 30, 2015 by stacy. With the weather still incredibly warm still, I’m finding that I have a harder time finishing projects that are meant for fall. 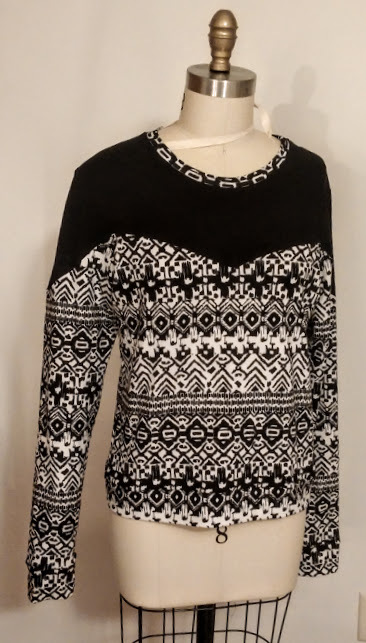 However, I did manage to complete the Sewaholic Fraser top that I mentioned yesterday and I love it (although admittedly, it looks like a winter sweater than a fall top). 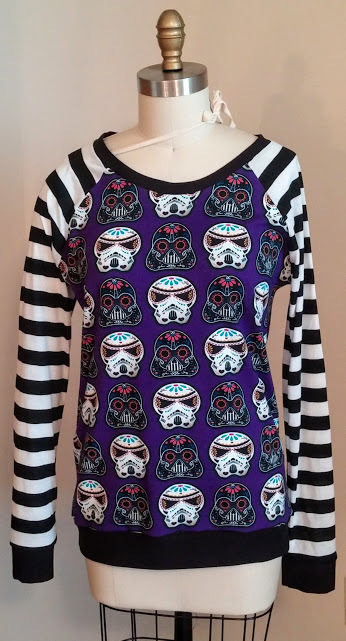 This was my first time sewing a Sewaholic pattern and was extremely pleased with how well it came together – the instructions were clear, everything lined up, and I love that the bands (hem, sleeve, and neck) were all marked so you never have to measure out the placement yourself (i.e. dividing the shirt and band into quarters). Since my measurements were much different than what was listed on the back of the pattern envelope (I went with my bust size), I was concerned about the fit. However, I think that this top works well on me, except the sleeves – they are way too long. In fact, they are so long I could easily remove the cuff and add a hem and it would still fit at an “appropriate length”. Even though this pattern is labeled as ‘easy to sew’, I would definitely rate this view a bit more advanced because of the insertion of the yoke and sleeve panels (both have ‘V’ shapes). However once you get past those points, its smooth sailing! Plan on seeing a few more of these tops\sweatshirts from me in the future. This entry was posted in Uncategorized on September 29, 2015 by stacy. I’m a sucker for new patterns – so when Sewaholic came out with a new collection late last week, I couldn’t resist buying one that caught my eye: The Fraser Sweatshirt. 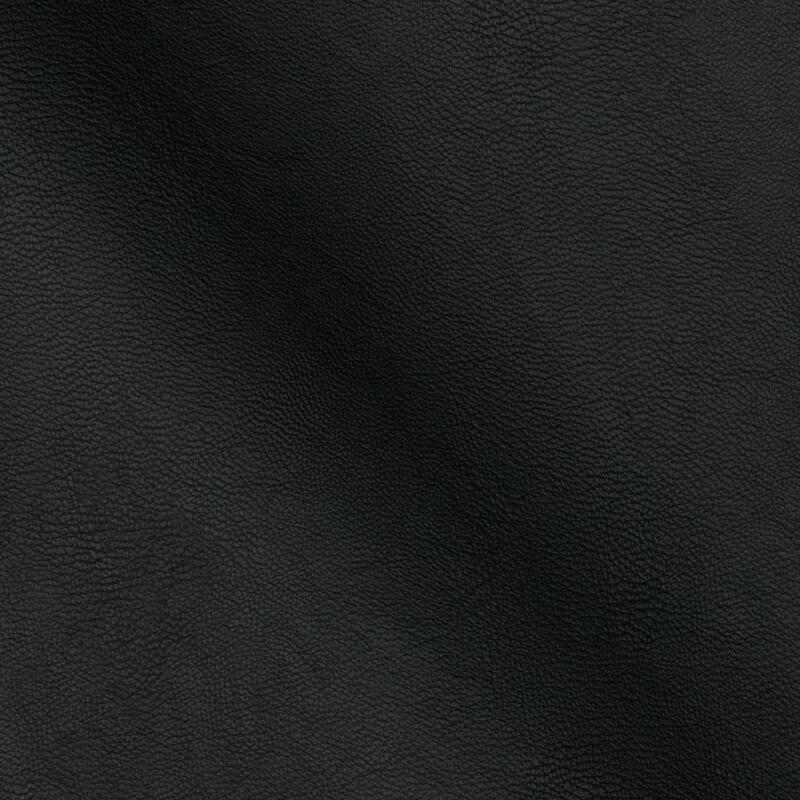 Since I don’t have any sweat shirting (or cool laser cut leather like in the model photo) on hand, I’ve decided I’m going to test out this pattern in one of my fabrics from the September Knit Fix: the body of the shirt in black and white diamond rows and the accents in a solid black jersey. Even though this is labeled a sweatshirt, the description lists it as being more fitted so I hope this turns out more like a funky (everyday) shirt and doesn’t look too “sloppy” in the end – I’m also hoping I don’t need to make too many modifications for future shirts (I’m really hoping that I can make one like the model) since this is my first time working with a pattern from this company and my measurements aren’t quite in line with their sizing. If all goes well, I may have a finished shirt tomorrow! This entry was posted in Uncategorized on September 28, 2015 by stacy. Progress on my Simplicity jacket is chugging along and I’m not sure that I like what is happening – it’s just so big and boxy (and I even went down one size). I stopped at the part where you add the lining and am pondering if I should take in the seams a bit to make it more fitted or just go with it the way it is. While I ponder what I am going to do, I decided to make Taylor a shirt that she had requested. You see when we went for her WSU college visit, she saw a black, long sleeved shirt with a fabric, chevron pocket (with the WuShock embroidered on it) that she really wanted…. it also cost $60. We knew that I could make this for substantially less so we never got it. 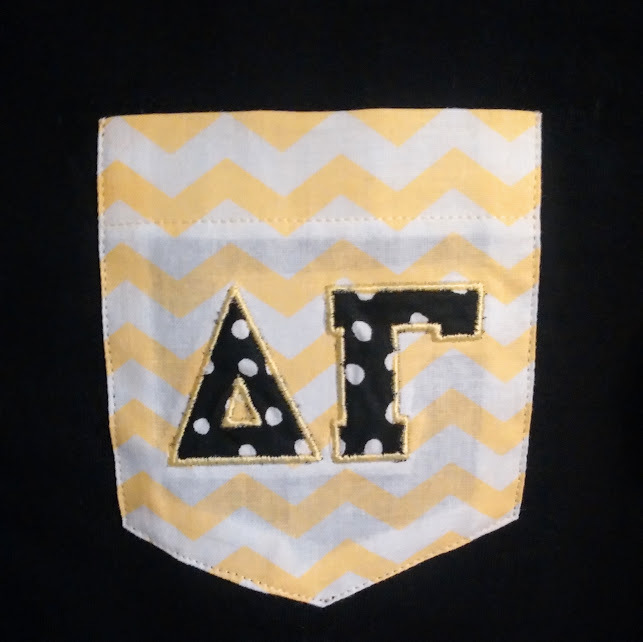 It took me all summer (and fall) to find the right yellow chevron (WSU colors are yellow and black), but I did it! Instead of adding Wu to the front, I embroidered her house’s letters (these had to be dramatically reduced to make it work – normally this is not recommended because in can distort the image, but because it is an applique it works…. although it does make it very difficult to trim the fabric because it is so small). As for the pocket shape\size – I just winged it (initially, it was much larger, but because I used such a contrasting material for the shirt, it looked massive)! If you’re wondering how much this project cost – it was a whopping $12! Talk about sewing saving you money! This entry was posted in Uncategorized on September 25, 2015 by stacy. Enter to win a copy of Stitch Kitsch and while you’re visiting the site, be sure to pick up the free Strawberry Applique Zipper Pouch pattern while you’re there. Learn how a (free) tee pattern is transformed into a cute kimono. Speaking of kimonos, this boho style kimono dress is absolutely adorable (the video has all the instructions you need to make one for yourself). Get the free pattern for Humphrey the Hound and make a snugly little dog stuffy today! Perfect for decorating your sewing room or just a pretty pincushion – a mini dress form (it’s easier than it looks). Tired of decorative pillows that all look the same? Change it up by adding snap closures! Who would have guessed that I’d be buying socks for a sewing project? But, I simply must make this sock turkey – it’s too cute! If bigger is better than you’ll definitely want to sew The Quintessential Plaid Tote – it’s massive! It’s time for pumpkin everything, even hot pads! What looks like a zipper strip really transforms itself into a cute little bag. Fall is officially here which means it’s scarf season (if it would ever cool down here). Learn how to make 30 different styles here. Looking for a no-sew look this Halloween? Be sure to check out this fun spider web cape tutorial. Reap the last bounty from your garden and keep your clothes clean after you make this easy Garden Frock. Cooler weather means more chapped lips. Learn how to make a Lip Balm Holder from your favorite ribbon. Looking for a new shirt that’s on trend and quick to sew? This tutorial shows you how to refashion two shirts to make a cute color blocked tunic. This entry was posted in Uncategorized on September 24, 2015 by stacy. 1. I went through a bit of withdrawal not being able to do my daily ‘internet stuff’… surfing on your phone is just not the same. 2. Yesterday became very expensive very quickly as a new modem had to be purchased and installed (there goes the fabric budget!). 3. I cut out a new project! This entry was posted in Uncategorized on September 23, 2015 by stacy. After a brief brainstorming session, I decided to put one of my September KnitFix fabrics to use making a new shirt. Because I apparently believe that one can not have too many raglan shirt patterns and decided to try out a new one… The Rainier Raglan (I purchased this pattern quite some time ago and never put it together until this weekend). 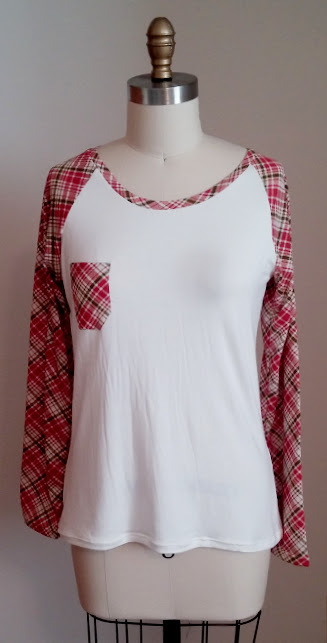 I bought a “papyrus” rayon spandex for the body of the shirt and used the plaid for the sleeves and neckline. In the end, I wound up adding a small pocket because it just added a bit more interest to the shirt. As for the fit, it’s a bit snug in the chest (it has some pulling on the upper bust area – I’m not sure that anyone but a sewist would notice though): I was a smidge larger in the bust than a small but the medium was going to be way too loose. Instead of cutting in between sizes, I went with a small (because the models for this shirt doesn’t look very fitted) and now realize that I could have went up a size without too much issue. Otherwise, this was a easy sew and fits very well everywhere else. Chances are I won’t be able to wear this one anyway because Taylor keeps telling me how much she likes it. I still have quite a bit of this plaid left over and plan on using it very soon for another project as well – I think this print far better than what I expected I would! 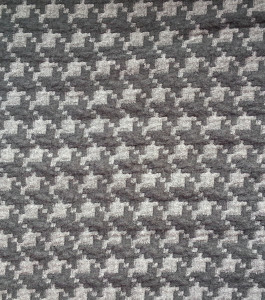 This entry was posted in Knit Fix on September 21, 2015 by stacy. 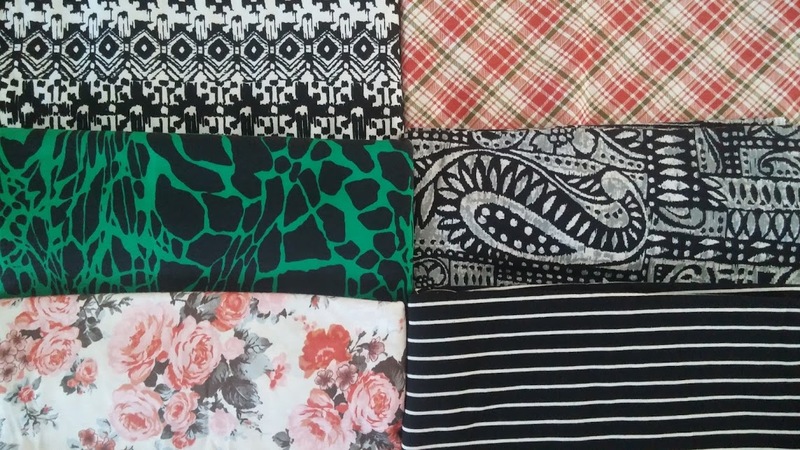 From left to right: Black and white diamond rows on cotton spandex knit, Green red mustard plaid cotton jersey blend knit, Green botanical spots on black Ponte de Roma knit, Gray black vintage ethnic jersey blend knit, Rose pink gray floral jersey blend knit, Black small cream stripe cotton jersey knit. This time I made the mistake of watching others receive their bags on the Girl Charlee Knitfix Facebook Group and sort of got my heart set on a particular one…. this one was not it. It’s not a bad grouping of fabrics – I love the stripe and the ethnic and diamond knits the best, but it’s not the bag I was wishing for (note to self, don’t watch the group to see what others got until after I receive my own!). The floral is fine (although I don’t wear a lot of floral print), but on the thinner side and the plaid is not in the colorway I wanted (it is also not a 4 way stretch so it won’t work for leggings). That green ‘botanical spots’ print is what really has me stumped, though. The fabric itself has a nice feel, but that print is very BOLD, even for me (plus I realized after I got this fabric, I never wear green). With that said, I’ve washed all the fabrics and am mulling over what I want to make with each of them (there is a contest going on this month where you can enter to win a free October bag by stitching up Indy patterns from the fabrics in you September Knit Fix bag…. 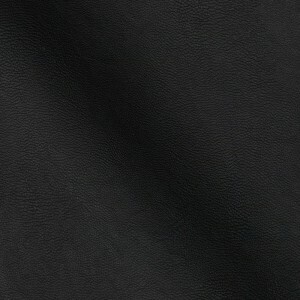 so I’m motivated to make some awesome garments!). On the sewing home front, I’ve been doing a bit of machine embroidery! 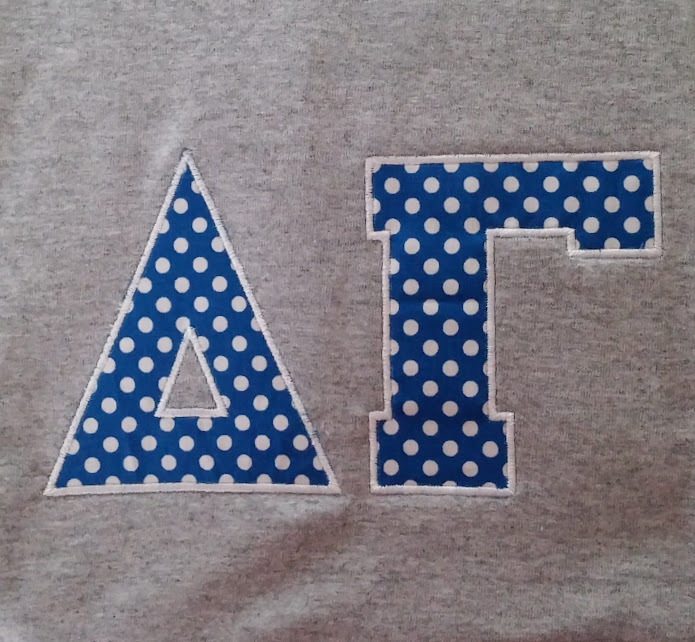 Taylor went through formal rush and joined a sorority this past week so I decided to purchase some cute Greek Alphabet letters to embellish some shirts, etc. 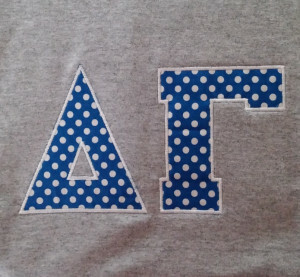 (appliqued shirts usually run about $25+ in stores\online, I spent $12, including the purchase of the embroidery files!). Since making this design so has requested a second, long sleeved, yellow chevron pocketed version (how’s that for specific?) to wear when it gets cool….. guess what I’m working on today? 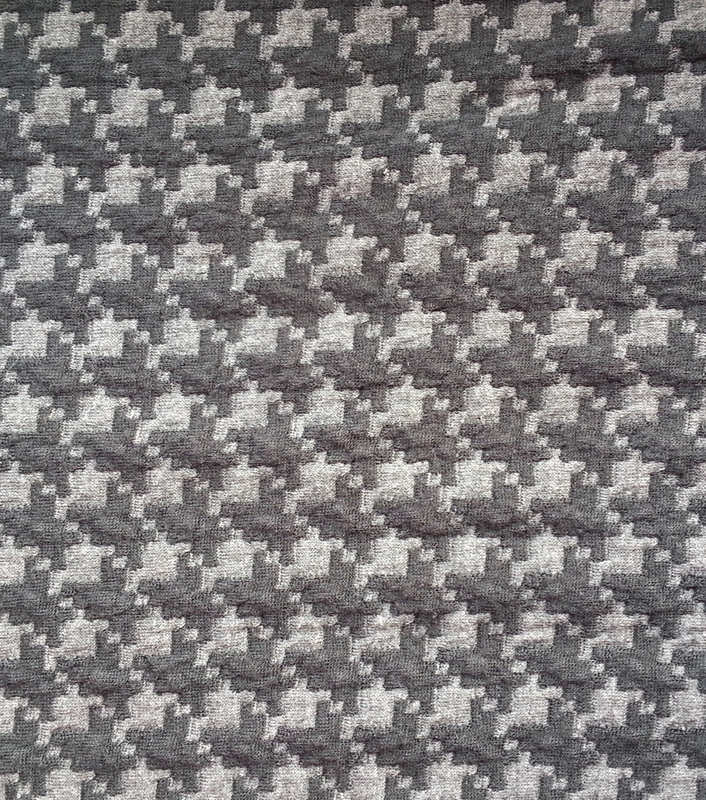 This entry was posted in Knit Fix on September 18, 2015 by stacy. Enter to win the gorgeous new Bernina 530 Swiss Red sewing machine! Even a beginner can sew this pretty Elegance Pleated Clutch. Create an Anthropologie inspired Comino top with this free pattern! Swoon is one of my favorite bag pattern designers and now you can get her Alice Shopper Tote for free! Speaking of bags, this article on Interfacing Bags & Totes is a great read! Getting chilly in the mornings\evenings? Head out with a Homeboy Hoodie and stay cozy. Keep little heads warm with adorable beanies.… there’s even 4 styles to choose from! In the US, today is Constitution Day! Celebrate by sewing a patriotic sock monkey (of course this makes an Awesome Captain American sock monkey too)! Sew a skirt that can be worn every day – it’s that easy to sew! Speaking of easy, this dress isn’t just easy to sew, it’s straight up flattering to wear too…. plus its free. Head over and get your Fit and Flare Dress now! Get ready for Halloween! This parrot costume will impress everyone and is easy to sew! Favorite tee got a hole? Now you don’t have to throw it out, just remake it into a pair of underwear. You know all those decorative stitches we have on our machines but never use? Now you can put them to work making this sewing machine cover. What makes this lunch bag different from others? It features a wide mouth opening so larger items can fit inside and everything can be easily seen. This entry was posted in Uncategorized on September 17, 2015 by stacy. …. And just like that my Lane Raglan is finished! This pattern had several options that I omitted that sped up the sewing process. First off, there is the hood. I initially cut out the pieces for the hood started sewing it and looked at how it fit and have to admit, it just didn’t work with this shirt. The pattern on the fabric is really bold and adding more with the hood just made it too much. Plus the hood itself is too large for the shirt (IMHO) so I sort of looked like a Sith Lord when I put it on (chances are I would never wear the hood anyway). The second option is adding thumb holes to the cuffs. I intended on doing this, but when I sewed my first cuff I left a hole (not the thumb hole, this was a hole that was in the seam) and I just couldn’t figure out how to fix it (I tried, I just kept missing it) so I scrapped the whole idea of adding thumb hole cuffs to my shirt because I only had enough material to remake one cuff (note to self: go buy more basic black knit). I’m sort of kicking myself now for not figuring out my mistake because this sleeve is really made to have thumb holes – they are very long and the cuff comes to mid-hand. The length on this is a bit odd – it’s clearly too long for me and hits me at a weird spot. It’s like it’s longer than a ‘standard’ shirt, but not long enough to wear with a legging to qualify it as a tunic. I think in the end I’ll just scrunch it up and wear it where I think it should hit me – the band at the bottom should keep it in place. It also runs a tad larger than what I expected. My sizing places me somewhere in between a ‘small’ and a ‘medium’ (I cut in between these line), but I clearly could have cut a straight out ‘small’ and been fine. 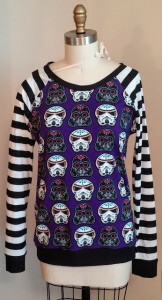 Overall, I like this shirt a lot – it’s a bit crazy looking and seems as if it’s made for Halloween (I think it’s the stripes with the purple combo), but it should be fun to wear when the weather turns cool. If I make this pattern again, I’ll definitely make some changes and definitely work on those thumb hole cuffs! This entry was posted in Uncategorized on September 16, 2015 by stacy.